There is no doubt that cats make for some pretty cool pets. With that being said, there is also no doubt that indoor cats can create quite the mess and stink. Yes, they have to go to the bathroom just like we do, but they use a litter box. Conventional litter boxes, while they are fine, are not ideal. You have to scoop the waste out manually, and that is undoubtedly inconvenient. What about self-cleaning litter boxes? They sound handy don’t they? That’s why we’re writing this article, to help you find the best self-cleaning litter box for both you and your cat. 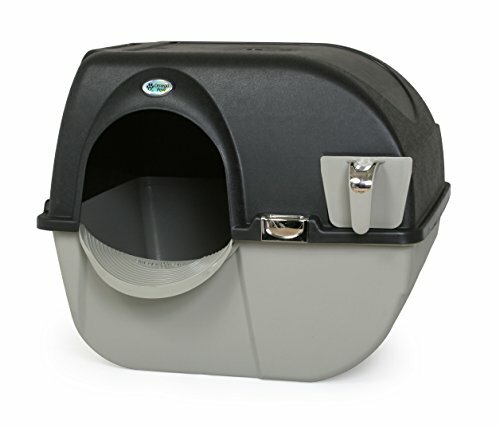 If you need an easy to operate, affordable, and long-lasting self-cleaning litter box, the PetSafe ScoopFree Self-Cleaning Litter Box is a great option to keep in mind. It costs a little more than a normal litter box, but it also does the work for you. The PetSafe ScoopFree Self-Cleaning Litter Box features a solid plastic tray that is not going to leak anytime soon. It’s a good option for containing the mess that cats make. What is also nice is that here you get litter crystals. These crystals don’t stick to your cat’s feet, which means that you won’t have litter being tracked throughout the home. These crystals are also made with special technology which traps and seals in both liquids and odors. What is really nice is that the PetSafe ScoopFree Self-Cleaning Litter Box features a waste trap. Every time your cat uses the litter box, a special mechanism works to scoop away the waste and seal it into the containment area. It locks away the sight and smell of the waste, which is fantastic. There is a disposable litter tray which you can simply remove and throw out once it is full. The downside is that the litter tray does need to be replaced on occasion. Keep in mind, there are safety sensors here to ensure that the PetSafe ScoopFree Self-Cleaning Litter Box does not try to scoop away waste while your cat is still in the litter box. All in all, while it’s not the cheapest litter box out there, and does need tray replacements, it’s a very handy and convenient option to consider. It certainly does a good job at containing cat waste and the odor which it creates. This option is a little more expensive than the one we just looked at, but not by much. On the other hand, it is designed to be used by more than one cat. 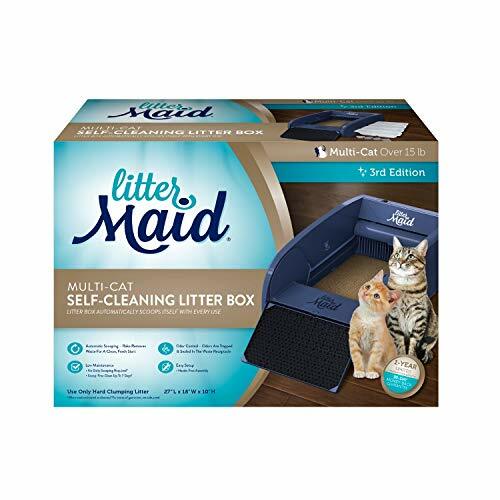 LOW MAINTENANCE: When used as directed, the LitterMaid Multi-Cat Self-Cleaning Litter Box requires no daily scooping, meaning you have a scoop-free clean up for up to 7 days. ODOR CONTROL: Once the rake removes waste, the waste receptacles with carbon filters keep mess and odor contained. LITTER BOX DESIGN KEEPS AREA CLEAN: Designed with high walls to prevent litter scatter and a paw cleaning ramp to help prevent tracking around the box. The LitterMaid Automatic Multi-Cat Litter Box is a good choice to keep in mind for a variety of reasons. First off, it has a pretty large area for the litter, more than enough space for 2 cats. The area for the litter is separated from the containment area. Once your cats use the litter box, the sensors will activate the scooping mechanism. The rake will then scoop away the waste into the containment area for later disposal. This litter box can be used by cats over 15 pounds, which is nice as well. What is really great about the LitterMaid Automatic Multi-Cat Litter Box is that the waste receptacle features a carbon filtration system. This system helps to totally kill and contain the odors created by cat waste, so you don’t have to smell it in your home. This item is made with solid plastic, so it’s not about to leak out any waste. 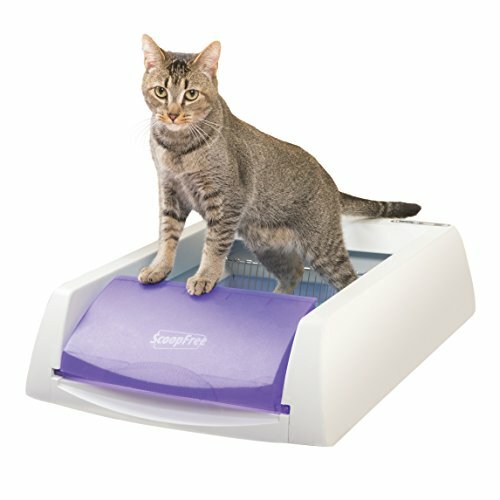 This litter box also comes with a specially designed ramp that is made to remove litter from your cat’s feet, so it does not track throughout your home. This item can be left for up to 7 days before it needs to be cleaned and emptied. This is quite a unique option to go with – a rolling cat litter box. It’s not exactly self-cleaning, but it will help make life easier. On that note, this item also costs about half as much as the others we have looked at. The Omega Paw Elite Self Cleaning Roll ‘n Clean Litter Box is quite simple to use. It is a rolling litter box with a lid. The lid helps keep the sight of waste away from you, plus it does an alright job at containing the smell, although not the best. What is cool here is that when you need to clean the litter box out, simply roll it on its side. When you roll it over, a special grate system separates clean litter from the waste. The waste falls into a tray which can be pulled out and removed from the litter box, therefore allowing for easy disposal. The lid of the Omega Paw Elite Self Cleaning Roll ‘n Clean Litter Box can be easily removed to clean the inside and to replace litter. It comes with a litter step to catch litter as your cat exits the litter box. In terms of the best self -leaning litter box out there, due to its ease of use, long-lasting design, and overall efficacy, we have to recommend the PetSafe ScoopFree Self-Cleaning Litter Box. The other two options are also fine, but overall, we think that the PetSafe is the easiest to use, operates the best, and provides the overall best results.